...but are extremely functional and easy to use. the home and the office. Bottom Bar and Arm In A Fully Retracted Position. If you’re looking for a sleek and stylish outdoor blinds solution, our Drop Arm Awnings in Melbourne are ideal. Drop Arm Awnings are essentially a sunblind with 2 pivoting arms, which pull the fabric in and out of the headbox. Their modern design provides an excellent balance of U.V protection and great looks. Unlike more traditional outdoor awnings, Drop Arm Awnings do not have any guides, channels or wires running down the window. With less moving parts, and built from corrosion proof materials, they are perfect for coastal areas, and we offer them at great prices. Through the use of a unique, award winning ‘Illios’ pivoting arm. Our Drop Arm Awnings can achieve a range of motion from 0-180 degrees of pitch control, which moves in an arch like motion. Our Drop Arm Awnings are engineered to deliver a superior outdoor blind that can withstand Melbourne weather. Our 5 Year warranty is testament to our quality and your peace of mind. Our drop arm awnings are made right here in Melbourne, Australia, supporting jobs and our local economy. 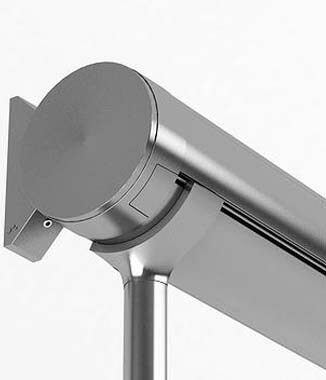 With its stylish good looks, we offer the European Red Dot Design Awarded Illios Drop Arm Awning . A premium state of the art product guaranteed to be a great focal point at any home. Our awnings have a pivoting range of motion of up to 180 degrees, this not only creates a canopy style feel, but also the option to position the fabric close to the window. Over 100 Fabrics To Choose From. We offer an extensive range of quality acrylic fabrics that will compliment any home or office. With over 100 different fabric styles and colours to choose from, we've got every taste covered.